TRENTON, N.J. -- New Jersey lawmakers will try again to pass a nearly $35 billion budget on Friday, hours before a midnight deadline to avert a state government shutdown that looms large due to a disagreement between Republican Gov. Chris Christie and a Democratic legislative leader over a measure targeting the state's largest health insurer. The Assembly and Senate are set to resume considering the spending plan despite Christie and Democratic Senate President Steve Sweeney's stalemate with Democratic Assembly Speaker Vincent Prieto. Prieto has refused to post a bill backed by Christie and Sweeney that would overhaul the state's largest health insurer. The parties agree on the underlying budget and a Christie proposal to shore up the state's underfunded pension by dedicating lottery revenues to it, but Christie is demanding lawmakers approve the proposal affecting Horizon Blue Cross Blue Shield. Sweeney on Thursday pushed through passage of the Senate Horizon bill and called on the Assembly to approve it. The budget itself, which includes about $350 million in Democratic spending priorities including $150 million for education, is stuck in the middle as Prieto promises to stake his speakership on preventing a vote on the insurance bill. He got only 24 votes out of a 52-member Democratic caucus when he posted the budget for a vote on Thursday. Many Democrats failed to register a vote, and Prieto canceled the session. 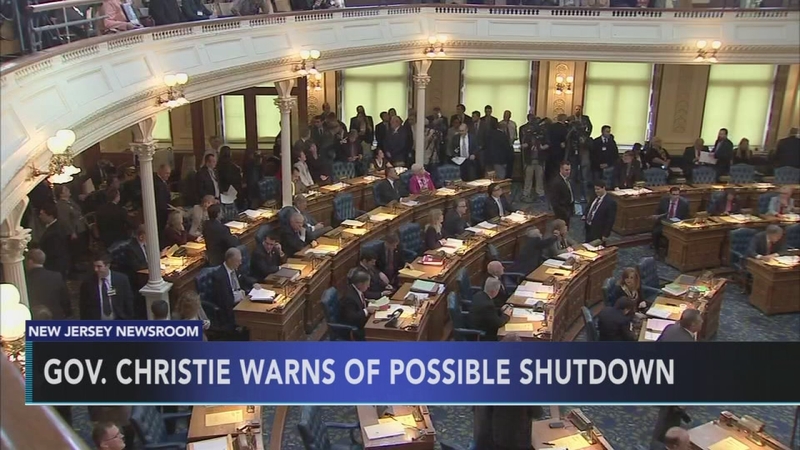 Christie, who is facing his final budget as governor and has said Prieto would shoulder the blame for any potential shutdown, told his Cabinet to prepare for closing down. The shutdown would hit just before the Fourth of July holiday and would mean state parks and nonessential services like the Motor Vehicles Commission would be shuttered. "I don't want to see Speaker Prieto kicking people out of Liberty State Park for Fourth of July this weekend," Christie said. "I don't want to see Speaker Prieto stopping people from going to Island Beach State Park this weekend during Fourth of July weekend, but this is purely up to him." Prieto said blame for a shutdown lies with the Assembly lawmakers who failed to support a budget that came through a Democrat-controlled committee. "Whoever doesn't vote for this budget will be voting for a government shutdown," Prieto said. In 2006, when the government shut down under Democratic Gov. Jon Corzine, road construction projects were required to wind down. Motor vehicle offices shuttered and about 45,000 state employees were furloughed. State courts were closed for anything but emergencies. State-run parks, beaches and historic sites remained open through the July Fourth holiday but closed afterward. Christie said Thursday that if a deal isn't reached then parks would be closed for the weekend, but beachgoers would still have plenty of options at local municipal beaches up and down the state's 127-mile coastline. The same holds true for municipal and county-run parks, which will still be open and unaffected by a state shutdown. Horizon has strongly fought back against the Christie proposal with an onslaught of lobbying. The nonprofit says using the surplus would lead to higher rates for its members. The Senate approved a different version of Christie's initial proposal that Christie, unveiled in February. Rather than tapping directly into Horizon's surplus, it requires that state insurance commissioner set a range for Horizon's surplus. When the top limit is exceeded, then the excess cash would go toward programs to benefit the public and policyholders under the Senate bill. Bill Castner, Horizon's head of corporate and regulatory affairs, told NJTV that the insurer was unable to negotiate an agreement with Christie about helping to pay for some state spending through the reserves "and now we find ourselves in the crosshairs of state government." "The fact that this is linked directly to school aid for children, this is what's going on in Washington," Castner said. "This is really what makes people frustrated with politics."